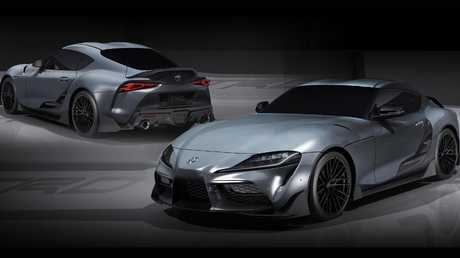 2019 Toyota Supra TRD concept. 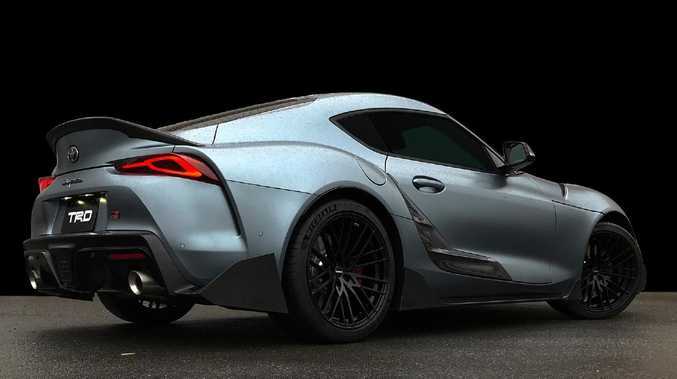 TOYOTA has offered enthusiasts a glimpse at factory-blessed aftermarket parts for its reborn Supra ahead of the car's Australian debut. As with many Japanese performance cars, the Supra is inextricably linked to the aftermarket parts industry. Helped by smash-hit movies and video games such as Gran Turismo and The Fast and The Furious, the Supra has always been associated with racing and performance modifications. Toyota's in-house tuning arm, Toyota Racing Development, will give customers a chance to take their cars to the next level. Unveiled at a trade show in Osaka, Japan, TRD's Performance Line Concept brings a range of upgrades to the turbocharged coupe. They include lightweight 19-inch alloy wheels with a similar style to Audi's R8 supercar and underbody elements augmented by exposed carbon fibre body additions for the bumpers, bootlid, doors and side sills. The enhancements promise to clean up the car's airflow while adding a touch of visual menace. TRD bodywork could come to Australia under the Gazoo Racing brand. Finished in bare carbon fibre, the display parts are not available for sale as yet. Potential customers should set aside more than $100,000 for a Supra with the lot, as the ultra-light components finished with an exposed weave would not come cheap. Mechanical elements under the skin appear unchanged - suggesting the show car will retain the Supra's BMW-derived turbocharged 3.0-litre six-cylinder engine, along with its 250kW and 500Nm outputs. A Toyota Australia spokesman said the company is looking into parts and accessories for the Supra, but could not confirm exactly what may be offered when the car goes on sale in the second half of 2019. What we do know is that Toyota will not use TRD-branded parts on local examples, as the manufacturer is committed to pushing Toyota's Gazoo Razing brand in Australia.